We are a locally owned and operated handicap van conversion business that has been serving Florida’s Treasure Coast since 1976. 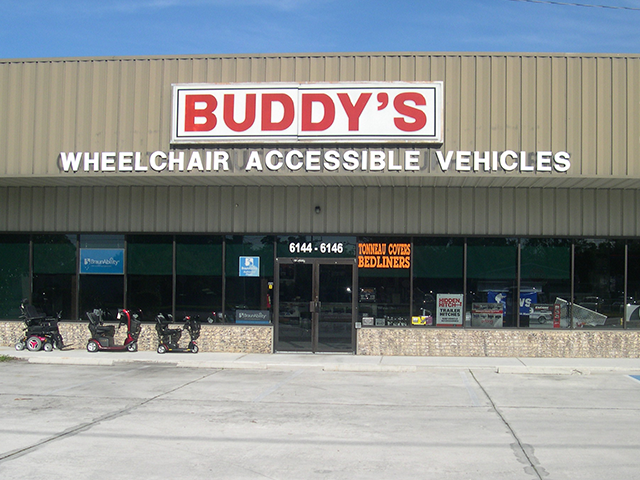 Buddy’s Holiday Mobility is the oldest and largest complete vehicle mobility dealer that sells, installs and repairs wheelchair accessible vans in St. Lucie County, Martin County, Indian River County and Okeechobee County. We back our work with a 100% guarantee. Buddy’s Holiday Mobility employs only certified technicians to work on conversion vans. We stay on top on the latest technology by continuing our education. Buddy’s Holiday Mobility is Factory Certified for: Braun, IMS, Chrysler-Dodge, Toyota and Honda. We are also Certified Installers for: Acura Mobility, Chrysler Mobility, Ford Mobility Motoring, GM Mobility Program, Honda Mobility, Lexus Mobility, Toyota Mobility, Volkswagen Mobility and Volvo Mobility.We feature: Braun, Chrysler-Dodge, Toyota, Honda Entervans, Rampvans and Viewpoint Rear Entry vehicles. As a valued customer, you will feel comfortable with our product knowledge and experience. We have earned a 5 Star-Platinum Van Dealer from BraunAbility, the world’s largest manufacturer of wheelchair accessible vans and wheelchair lift systems in the industry. We understand the importance of a vehicle that meets your needs and lifestyle. Contact us by completing the online form or calling us today!